All school kids need a display of their letters, numbers, and times tables – so why not get one that you will love to look at? These classy vintage-style charts complement the decor while keeping kids on top of their lessons. Looking for something special for the study nook, nursery, or even the lounge room wall? We have found some fabulously quaint hanging charts that are both stylish and useful. The chalkboard background design on these lovely handmade cotton charts give a nostalgic feel for parents and a chic vintage look for the room. In either black or green chalkboard styles, the lettering on all the charts is clear and comes in a variety of writing styles. It’s a gorgeous fun learning tool for young students. 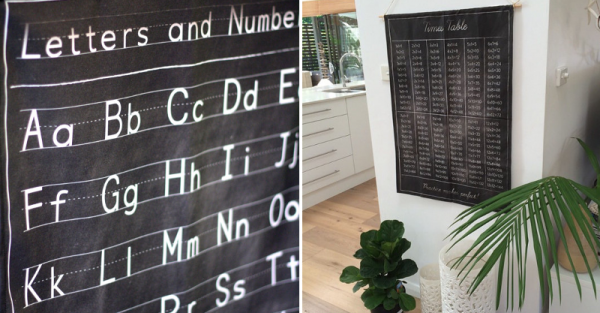 These charming charts are hand printed on ethically produced and environmentally friendly cotton right here in Australia. We just love discovering these local gems and supporting small Australian business. You can see the full selection of charts at My Bearded Pigeon. All charts are priced at $69 and ship worldwide.